V6 youngest member Ken Miyake has formed a brand new duo with one half of Tackey & Tsubasa, Hideaki Takizawa, called KEN☆Tackey. 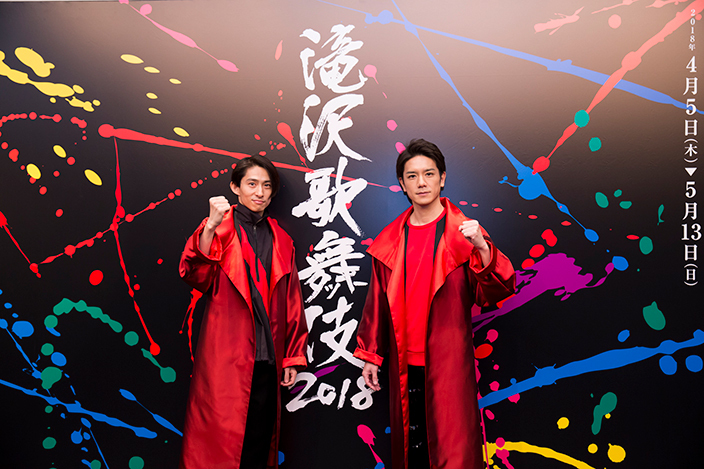 The unit was formed in support of Takizawa’s annual stage play titled Takizawa Kabuki. The 2018 version begins performances today on April 5th, and will run until May 13th at the Shinbashi Enbjo in Tokyo. Starting in June the show will head to Nagoya. Takizawa Kabuki has been around for well over a decade now, and the continued success has lead Takizawa to become chairman of the entire project. The performance is his own take on Kabuki, a classical dance-drama known for it’s elaborate makeup. Takizawa’s version heavily incorporates illusions, flight, and choreographed fight scenes. A CD for Takizawa Kabuki will be released in the summer, and KEN☆Tackey’s debut song will be titled Gyakuten Lovers. Miyake previously appeared in the 2016 version of Takizawa Kabuki, receiving rave reviews. Luckily for fans, the unit will be under avex trax which means content for the duo will be uploaded on their official YouTube channel.